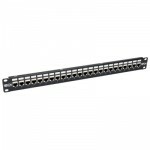 The N254-024-SH-6A 24-Port 1U Rack-Mount STP Shielded Cat6a Feedthrough Patch Panel meets or exceeds Cat6a specifications and works with USOC, T568A and T568B wiring to comply with industry standards. Fully rated for 10 Gbps Ethernet data transfer speeds, this low-profile patch panel manages and organizes the cabling in your high-density network. No 110 punchdown termination is required. Just plug your Cat6a cables into the 24 fully shielded RJ45 coupler jacks on both sides of the panel. The detachable cable management bar keeps patch cables neat, tidy and efficiently organized on the back of the panel. Ports are clearly numbered and labeled to help you identify connections. Mounts easily into 1U of an EIA-standard 19-inch rack. Grounding wire included.